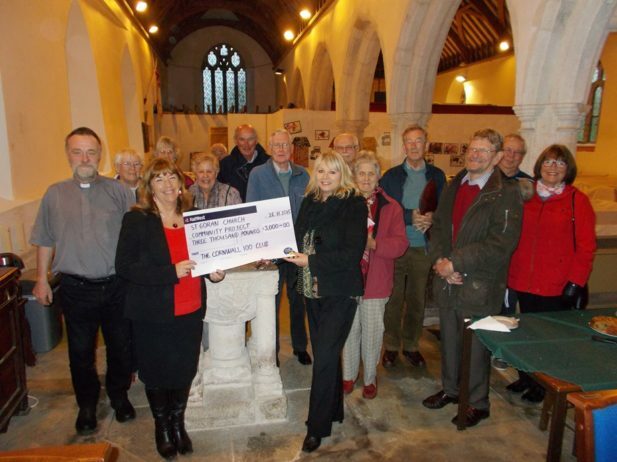 St Goran Church Community Project has received £3,000 from Cornwall Community Foundation’s business club to help fund fittings and equipment in the new community kitchen of the church. Cornwall 100 Club members Katie Law from Millerson estate agents and Sue Bradbury from PR and marketing company SBPR visited the project to present the cheque. The new kitchen forms part of work being undertaken by St Goran Church Community Project to transform the west end of the church by building a large community room, a further meeting room, two toilets (one disabled) and a new all-weather disabled access. St Goran is used for a wide range of events including games for the elderly every month, flower arranging, bell ringing, concerts, lunches, school concerts and other end of term activities for Gorran School. The church, which can seat over 300 people, is currently underutilised because of the lack of facilities and those with mobility problems find it difficult to get into the church because of the steps.